The King's Own Immemorial 1st Infantry Regiment (Spanish: Regimiento de Infantería Inmemorial del Rey n.º 1) of the Spanish Army is claimed to be the oldest continuously operating military unit in the world. King Ferdinand III of Castille, in 1248, during the conquest of Seville, with some of his men-at-arms, assaulted and took a tower. Seemingly, with such boldness and bravery they gained the admiration of the King. The campaign finished and with the consequent disbandment of troops, King Ferdinand decided to permanently keep that force on the rolls, making one of the first standing armies in Europe since the Roman Empire. On 28 August 1632, on the initiative of Philip IV, a special Corps of troops was ordered to be formed with veteran soldiers, reenlistments and Knights of noble ancestry - men so skilled that they only took arms when the Monarch assumed command in person, designating it "King's Guard Colonelship." Its organization commenced in Almansa in 1634, its force fixed at fifteen companies with 90 harquebusiers, 40 musketeers, and 60 corslets and pikemen each. Later, in 1638, it was augmented to twenty. Its first Colonel, Count Duke of Olivares, Don Gaspar de Guzmán, whose post was the recently created "King's Guard Colonelship," was in command of very distinguished soldiers of great renown. In 1640, Philip IV elevated it to the category of King's Guard Regiment and in 1664 to Castile Tercio. From 1701 to 1710 it was dedicated to its ancient mission, guarding the Monarch, and it was in 1707 when it received the designation Castile, and in 1710 that of Castile Immemorial Infantry Regiment. It gained glory in the Spanish War of Succession and the Italian Campaigns (1718-1749), eventually it received the name King's Infantry Regiment on 7 January 1766. That same year, King Charles III, persuaded by the antiquity of the Regiment, declared it the King's Immemorial. After diverse historical changes in losing and receiving its name, it received its present designation in 1995. Traditionally, as the Regiment is linked to the Spanish Royal Family and to the Sovereign in his/her duty as Captain General and Commander-in-Chief of the Armed Forces, all the Princes of Asturias since 1862 are enrolled as Honorary soldiers in the 1st Company. Following the tradition then Don Felipe de Borbón y Grecia (Prince of Asturias and heir to the Crown) assumed his post as a soldier in 1977. Instead of uniformity and as what is practiced in other countries with a military tradition, in Spain as well, King Juan Carlos I in 1981 accepted the proposal of the CSA to equip two companies, which could render honors and participate in established ceremonies special in character, with the uniforms and armaments of the end of the reign of Charles III. The first honor guard company wears a white uniform, with the green emblem, that of the King, by special grace it was dressed elegantly in the colors of the Royal Household troops, and as a special grace they wore botoneras on the vest and dress coat. The second company wears a blue uniform. Grenadiers in the modern 1st King's Immemorial Infantry Regiment are not permitted to wear glasses, but beards have recently been permitted. Historically selection for the grenadier companies of the Spanish infantry was a distinction normally reserved for the bravest and tallest soldiers of a regiment. These picked men marched at the head of the regiment, escorted the colors and were expected to form the vanguard when storming a fortified position. They wore short sabers, a distinction retained in the modern regiment. The high grenadier cap still worn, augmented their stature and the brass mechero on the strap of the cartridge pouch and the sardinetas worn on their cuffs distinguished these elite companies. The uniform is worn by staff personnel and the marker unit (gastadores). In addition to the 18th century uniforms described above, the 1st King's Immemorial Infantry Regiment parades detachments of up to company strength, plus the regimental band, in the full dress uniform of the Spanish line infantry, as worn during the reign of King Alfonso XIII (1902-1931). This consists of the distinctive "ros" (shako), dark blue tunics with red facings and red trousers. Giving security to the people as well as to the installations of Headquarters. Organising and directing services necessary to guarantee the optimal functioning of material resources in the service of Buenavista Palace, and the supply of the Centers into which it is integrated. In this way also it also guarantees, through its transport assets, the mobility of the authorities and the board of Headquarters. Rendering prescribed honors within the garrison of Madrid and as an exception in other garrisons. This function, perhaps the best known by the public in general, gives pomp and colour to various social functions. This function entails, in broad outline, the reception of Heads of State and other Civil and Military Authorities and the participation in cultural, social and religious functions of great relevance in Madrid and elsewhere. "Old Guard of Castille" Honor Guard Battalion, charged with guard of honor duties and other ceremonial and public duties, with two companies of Infantry, a section of Artillery with six 105/14 howitzers, and a Corps of Drums wearing uniforms and playing period instruments of the 1780s alongside modern day plain bugles. Automobile unit with 274 luxury vehicles. Support Unit with two companies, one of Security which gives security to the installations as well as to the personnel of Army Headquarters and to the Centers and Institutions located in Buenavista Palace and the other company of Staff and Support where army personnel who execute functions of administrative support to the Centers and Institutions of AHQ are assigned. Service Unit composed of a company and two Units, one of Installations Support and the other of Personnel Support. The Service Company gives mechanical support to Buenavista Palace whereas the Units keep watch over the proper functioning of the installations and the well-being of personnel posted at AHQ. The Regimental Band Unit composed of 65 members, well known all over Spain for its excellent concerts, wearing Infantry regulation dress uniforms from 1908. In addition to these usual functions, the regiment has participated in actions on behalf of the civilian population when required, e.g. environmental cleaning carried out in Galicia because of the sinking of the Prestige, etc. 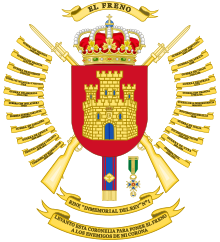 Wikimedia Commons has media related to Spanish Army's 1st Immemorial Infantry Regiment of the King.